Joe Jackson is one of those artists who don't have to prove themselves any more. During his long career he has shown to be a versatile artist. The many albums he released emphasize this. He wasn't afraid to experiment either and showed to feel comfortable in jazz too. A fine example for this is Jumpin' Jive. Now he's trying a jazz record once more and not an easy one. 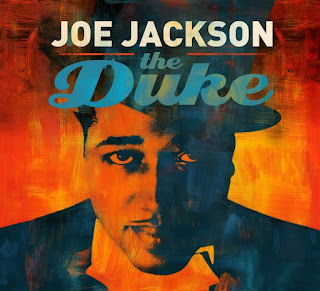 Jackson is honouring jazz legend Duke Ellington this time. Versatility definitely is true for Ellington too. The great master was a gifted piano player, brilliant composer and successful band leader of his own big-band. He worked together with all the stars of his generation. This is where Jackson is making a good choice. On his arrangements he's also working together with famous and diverse artists like Steve Vai, Sharon Jones and Iggy Pop. Putting big names together isn't always a guarantee for success, but in this case it's working very well. Jackson himself mostly remains on the background. Only once and a while he's playing the piano or you can hear his vocals. It's clear that he wants Ellington and his compositions to be the center of attention. No one but the jazz genius himself is allowed to steal the show. And that's giving the album that extra sparkle. Jackson did give many songs a different twist. 'Perdido/Satin Doll' turns into a swinging Latin party and 'Caravan' into a solid pop song. Other songs, like the famous 'Mood Indigo' are diverging less and are breathing the atmosphere of smoky dark jazz clubs from the time "The Duke" himself was active. This beautiful song is also showing how much work went into the arrangements. But especially the fun in playing the sparkling songs is obvious. All guest artists, like Jackson, made themselves subordinate to the song. The compositions only got stronger because of this and are revealing the unique talent and incredible quality of Ellington. 'It Don't Mean A Thing If It Ain't Got That Swing' is the striking closer of the record. And Joe Jackson's swing is more than fine. Listen to 'The Duke' on Spotify.